Hey, where did you get those cool looking black high top chucks? Films on this page: Wadjda, Waiting, The Wake, Walking and Talking, The Walking Deceased, The War, Warlock: The Armageddon, The Warriors, The Wash, Watch It, Watching the Detectives, The Watchman’s Canoe, Wayne’s World, Wayne’s World 2, Ways to Live Forever, Wee Sing in the Marvelous Musical Mansion, Weekend at Bernie’s, Weekend at Bernie’s II, Weird Science, Welcome to Germany, West Side Story, Wet Hot American Summer, What’s Eating Gilbert Grape, When a Stranger Calls, When The Smoke Clears, When Zachary Beaver Came To Town, Where the Buffalo Roam, Whiplash, White Bird in a Blizzard, White Squall, White Wolves: A Cry in the Wild II, White Wolves II: Legend of the Wild, Wide Awake, Wiener Dog Nationals, Wild America, Wild Tigers I Have Known, Wildcats, Wildlife, WishCraft, The Witching of Ben Wagner, The Wiz Kid, Wolfen, Wonderstruck, World Famous Kid Detective, Worst Friends, The Wrong Guys, Wrong Turn. More films are listed alphabetically: #	A B C D E F G H I J K L M N O P Q R S T U V W X Y Z.
Wadjda. (2012) Waad Mohammed, Reem Abdullah, Abdullrahman Al Gohani, Ahd, Sultan Al Assaf, Alanoud Sajini. Written and directed by Haifaa Al-Mansour. An enterprising Saudi girl whose independent ways and dress (she always wears black high top chucks) are seen by many as defiant in the restrictive culture for women in that country, signs on for her school’s Quran recitation competition as a way to raise the remaining funds she needs in order to buy a green bicycle that has captured her interest. Waiting. (2005) Ryan Reynolds, Anna Faris, Justin Long, David Koechner, Luis Guzmán, Chi McBride, John Francis Daley, Kaitlin Doubleday, Robert Patrick Benedict, Alanna Ubachi. Directed by Rob McKittrick. Young employees at Shenaniganz restaurant collectively stave off boredom and adulthood with their antics. The Wake. (2017) Bryan Brewer, Alle Rivera, Darla Delgado, Michael Aaron Milligan, Kristen Dalton, Amanda Musso. Directed by Faouzi Brahimi. A group of friends attend the wake of a child they accidentally killed with their car. Once at the wake, they find themselves trapped and stalked by a masked assailant. Walking and Talking. (1996) Catherine Keener, Anne Heche, Todd Field, Liev Schreiber, Randall Batinkioff, Kevin Corrigan. Directed by Nicole Holofcener. A comedy about four friends looking for love in the nineties. The Walking Deceased. (2015) Tim Ogletree, Joey Oglesby, Dave Sheridan, Troy Ogletree, Sophia Taylor Ali, Danielle Garcia, Mason Dakota Galyon, Jacqui Holland. Directed by Scott Dow. 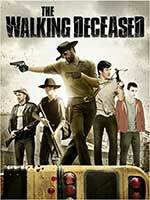 A somewhat tasteless spoof of The Walking Dead. The War. (1994) Kevin Costner, Elijah Wood, Mare Winningham, Lexi Randall, Christopher Fennell. Directed by Tom Avnet. With the help of their friends, Stu and Lidia Simmons are determined to build the ultimate treehouse in the summer of 1970. But some low life bullies are determined to prevent this from happening. Categories: Drama, Family, Coming of Age. Warlock: The Armageddon. (1993) Julian Sands, Paula Marshall, Chris Young, Joanna Pacula. Directed by Tony Hickox. Satan’s only son, the warlock, plots to free his father from the fiery chains that imprison him and unleash his wrath upon the world. The only ones who can prevent this are two young warriors who alone possess the supernatural powers to challenge the warlock and stop the inevitable Armageddon. The Warriors. (1979) Michael Beck, James Remar, Marcelino Sanchez, Dorsey Wright, Brian Tyler, David Harris, Tom McKitterick. Directed by Walter Hill. When the Warriors, a New York City street gang, attend a gang summit meeting, they are set up and blamed for the death of a rival gang leader. Now they must try to return to their territory, with every other gang member out to get them. The Wash. (2001) Dr. Dre, Snoop Dogg, George Wallace, Bruce Bruce, Tommy Chong, Angel Conwell. Written and directed by DJ Pooh. With the rent due and his car booted, Sean has to come up with some cash fast. When his best friend and roommate Dee Loc suggests that Sean get a job at the car wash where he works, tensions flare when Sean is hired as Dee’s supervisor. Watch It. (1993) Peter Gallagher, Suzy Amis, John C. McGinley, Jon Tenney, Cynthia Stevenson, Lili Taylor Tom Sizemore. Directed by Tom Flynn. A film about four thirty-something housemates in Chicago and their problems with making commitments to the women in their lives. Watching the Detectives. (2007) Cillian Murphy, Lucy Liu. Written and directed by Paul Soter. A video store owner wishes his life could be as exciting as the movies he watches. Enter Violet, a real life femme fatale who suddenly brings excitement into Neil’s life. The Watchman’s Canoe. (2017) Kiri Goodson, Mathew Johnson, Roger Willie, Stephanie Wallace, Jennifer Oswald, Adam Beach, Ian Stevenson, Carter Jon, Jason Hinds, Joshua Hinds, Lorenzo Norris, Ryan Scott. Written and directed by Barri Chase. In 1969 Jett, a young girl of mixed Caucasian and native American descent, struggles to fit into her community and school after moving to a new reservation and being bullied for being too white. Spending much of her time alone outside, she discovers her special connection with nature. Luckily her cousin Peedie comes to visit for the summer. With his help and that of a tribal Watchman, Jett embarks on a spiritual journey to discover her destiny. Wayne’s World. (1992) Michael Meyers, Dana Carvey, Rob Lowe, Tia Carrera, Brian Doyle-Murray, Lara Flynn Boyle, Kurt Fuller, Colleen Camp, Donna Dixon, Meat Loaf. Directed by Penelope Spheeris. The first of two feature films based on the popular Saturday Night Live comedy segment about two young guys into the heavy metal scene who broadcast a weekly program on the Aurora, Illinois public access channel. Funny situations, creative dialogue, and Mike Meyer’s self-deprecating approach to the project make this film work. Wayne’s World 2. (1994) Michael Meyers, Dana Carvey, Christopher Walken, Tia Carrera, Ralph Brown, Aerosmith. Directed by Stepen Surjik. Wayne gets a message in a dream to put on a rock concert and so “Waynestock” is born in the sequel to the original blockbuster. But first Wayne and Garth must save his girl friend from a sinister record producer. Ways To Live Forever. (2010) Robbie Kay, Ben Chaplin, Emilia Fox, Alex Etel, Greta Scacchi. Written and directed by Gustavo Ron. Sam, a twelve-year-old boy suffering from leukemia wants to know everything he can about life, his disease, and death, a possibility he might face. Together with his best friend, Felix, he embarks on a “scientific investigation” and a bucket list of things to do and find out. Wee Sing in the Marvelous Musical Mansion. (1996) Dana Young, Vana O’Brien, Steve Smith, Ariel Aver, L’Kaika Young. Directed by David Poulshock. This sing-a-long family musical is a series of songs meant for very young kids held together with a thin mystery plot between the songs. Weekend at Bernie’s. (1989) Andrew McCarthy, Jonathan Silverman, Catherine May Stewart, Terry Kisar. Directed by Ted Kotcheff. When Larry and Rchard, two ambitious young insurance company employees, accidentally uncover an embezzlement scheme, their boss Bernie rewards them by inviting them to his beachside house for the weekend. But when they arrive they find that Bermie is dead and has set them up as the fall guys. In order to stay and figure out how to what to do, they must maintain the illusion that he is still alive. Weekend at Bernie’s II. (1993) Andrew McCarthy, Jonathan Silverman, Barry Bostwick, Terry Kisar, Tom Wright, Steve James, Troy Beyer. Directed by Robert Klane. Richard and Larry return to work only to discover that they have been fired as the suspects for the embezzlement. But they know that Bernie had stashed the stolen money in the Virgin Islands. The two head there, with Bernie’s body still in tow, to find the money and clear their names. Categories: Comedy, Teenagers, Sexually Explicit. Welcome to Germany (Wilkommen bei den Hartmanns). (2016) Senta Berger, Heiner Lauterbach, Palina Rojinski, Florian David Fitz, Elyas M'Barek, Eric Kabongo. Written and directed by Simon Verhoeven. A well-off Munich family offers boarding to a refugee from Nigeria. Diallo soon makes friends among the family members, but they are tested when they have to face racism, bureaucracy and terrorism suspicions because of him. West Side Story. (1961) Natalie Wood, Richard Beymer, George Chakiris, Rita Moreno, Russ Tamblyn. Directed by Robert Wise and Jerome Robbins. This film version of the trend setting Broadway musical about two rival gangs in Manhattan’s Hell’s Kitchen influenced a generation and won numerous Academy Awards. This modern day Romeo and Juliet remake has a fabulous musical score by Leonard Bernstein with lyrics by Stephen Sondheim, impressive choreography by Jerome Robbins, and strong performances by the principal actors. Chucks have an important role in the costuming, with the Jets wearing white low cuts, and the Sharks wearing black low cuts. Wet Hot American Summer. (2001) Janeane Garafalo, David Hyde Pierce, Paul Rudd, Molly Shannon, Michael Showalter, Amy Poehler, Elizabeth Banks, Bradley Cooper. Directed by David Wain. Set on the last day of camp, in the hot summer of 1981, a group of counselors try to complete their unfinished business before the day ends. What’s Eating Gilbert Grape. (1993) Johnny Depp, Leonardo DiCaprio, Juliette Lewis, Mary Steenburgen, Darlene Cates, Laura Harrington, Kevin Tighe. Directed by Lasse Hallstrom. Johnny Depp plays Gilbert and Juliette Lewis is the girl who turns his life around. Leonardo di Caprio received an Oscar nomination for his role as Gilbert’s mentally impaired younger brother. When a Stranger Calls. (2006) Camilla Belle, Tommy Flanagan, Katie Cassidy, Tessa Thompson, Brian Geraghty, Clark Gregg. Directed by Simon West. A teenaged babysitter at an isolated house is harassed by an increasingly threatening prank caller. When The Smoke Clears. (2009) Chris Carmack, Jonathan Greene, Otto Bernardin, Mark Straub, Kevin Price, Maurice Tscherny, Nick Erlich. Written and directed by Kevin Sockwell. The lives of three teenaged friends take a dramtic turn when they find out a fourth buddy is selling drugs and they are taken hostage by the drug dealers to prevent them from telling the authorities. When Zachary Beaver Came To Town. (2003) Jonathan Lipnicki, Cody Linley, Sasha Neulinger, Eric Stoltz, Jane Krakowsky, Kathllen Lancaster, Brady Coleman. Directed by John Schultz. Two young boys in a small Texas town begin to learn about life one summer when Zachary Beaver, “the world’s fattest boy” comes to town. Where the Buffalo Roam. (1980) Peter Boyle, Bill Murray, Rene Auberjonois, Bruno Kirby. Directed by Art Linson. Another film (see Fear and Loathing in Las Vegas) celebrating the exploits of “gonzo” journalist Hunter Thompson. This time Bill Murray stars as the alcohol and chemical crazed reporter, who covers a drug trial in San Francisco, has a one-on-one bathroom interview with Richard Nixon, and gives away his Superbowl tickets so he can cover the game from his hotel room. Whiplash. (2014) Miles Teller, J.K. Simmons, Paul Reiser, Melissa Benoist. Written and directed by Damien Chazelle. A promising young big band drummer enrolls at a prestigious music conservatory with dreams of making it big. He is soon discovered by the top jazz band instructor, but his life becomes a living hell due to the cruel and abusive treatment that he (and other band members) receive in rehearsals and at performances. White Bird in a Blizzard. (2014) Shailene Woodley, Eva Green, Christopher Meloni, Shiloh Fernandez, Gabourey Sidibe, Angela Bassett. Written and directed by Gregg Araki. In 1988, a teenage girl's life is thrown into chaos when her mother disappears. Categories: Drama, Mystery, Sexually Explicit. White Squall. (1996) Jeff Bridges, Caroline Goddall, John Savage, Scott Wolf, Jeremy Sisto, Ryan Phillippe, David Lascher, Eric Michael Cole, Jason Marsden, David Selby, Julio Oscar Mechoso, Zeliko Ivanek, Balthazar Getty, Ethan Embry, Jordan Clark. Directed by Ridley Scott. Jeff Bridges plays a ship captain who takes a crew of high school students on a voyage to the Caribbean. But just before their return, a violent sea storm turns the journey into a test of their courage and will to survive. Categories: Drama, Coming of Age, Teenagers. White Wolves: A Cry in the Wild II. (1993) Amy Dolenz, David Moscow, Mark-Paul Gosselaar, Marc Riffon, Matt McCoy, Amy O’Neill. Written and directed by Catherine Cyran. Five teenagers on a two-week trip through the Cascade Mountains are severely challenged when their guide and teacher falls off a cliff and they must figure out how to rescue him. White Wolves II: Legend of the Wild. (1995) Elizabeth Berkley, Jeremy London, Corin Nemec, Ernie Reyes, Jr., Justin Whalein, Ele Keats. Directed by Terence Winkless. Given the chance to clear their school records, a group of misfit teens reluctantly ventures into the majestic but unforgiving wilderness to help a young naturalist save the vanishing wolves. After their leader is seriously injured, they must battle whitewater rapids, deadly predators, and ultimately themselves in order to survive. Wide Awake. (1998) Joseph Cross, Timothy Reifsnyder, Dana Delany, Denis Leary, Robert Loggia, Rosie O’Donnell. Written and directed by M. Night Shyamalan. Joshua Beal, a fifth grader attending an affluent Catholic school in the Philadelphia area is in the midst of a spiritual crisis. His beloved grandfather has recently passed away from bone marrow cancer, and Joshua has been depressed ever since. Only his best friend Dave O’Hara seems capable of keeping Joshua on the ball, and when Dave confronts him about his behavior, Joshua tells him that he is embarking on a spiritual mission to seek a sign from God that his grandfather is okay in order to validate all of the spiritual beliefs that he has learned in school. Wiener Dog Nationals. (2013) Julian Feder, Caitlin Carmichael, Jason London, Alicia Witt, Morgan Fairchild, Bryan Batt, Austin Anderson. Written and directed by Kevan Peterson. Young Danny and his family adopts Shelley, a runt of a dachshund from a shelter. The dog has potential as a racer however, and the family ends up taking him to a national race despite opposition and interference from other competitors. Wild America. (1997) Jonathan Taylor Thomas, Devon Sawa, Scott Bairstow, Jamey Sheridan, Frances Fisher. Directed by William Dear. Mark and Marty Stouffer have dreams of becoming filmmakers, and inspired by an article in an outdoor magazine, begin to photograph animals in their natural environments. When their mom buys them a used 16mm camera, they plan a trip to film the vanishing wildlife of America before it’s too late. Marty and Mark set out on their trip, but soon discover an unexpected stowaway, Marshall, who didn’t want to stay at home and miss the adventure. Wild Tigers I Have Known. (2006) Malcolm Stumpf, Patrick White, Max Paradise, Fairuza Balk, Hailey Anne Nelson, Kim Dickens. Written and directed by Cam Archer. A 13-year-old boy learns to cope with his newfound sexuality and his unrequited love for the cool kid in school. Categories: Coming of Age, Sexually Explicit. Wildcats. (1986) Goldie Hawn, Swoozie Kurtz, James Keach, Nipsey Russell, Weslie Snipes, Woody Harrelson. Directed by Michael Ritchie. Molly McGrath is a high school track coach and football expert who wants to coach junior varsity football at her school. When she is denied the opportunity by the head football coach, she takes a job coaching at an inner city high school. Wildlife. (2018) Ed Oxenbould, Jake Gyllenhaal, Carey Mulligan, Bill Camp, Zoe Margaret Colletti. Written and directed by Paul Dano. A teenage boy must deal with the impending breakup of his family after his father goes away to fight fires in the mountains and his mother responds by becoming independent and having an affair with an older man. WishCraft. (2002) Michael Weston, Alexandra Holden, Austin Pendleton, A.J. Buckley, Michael Aday, Alexandra Breckenridge. Directed by Danny Graves. When a high school student receives a mysterious totem that grants three wishes, he discovers that dreams can come true...with a vengeance. The Witching of Ben Wagner. (1987) Sam Bottoms, Harriet Hall, Bettina Rae, Justin Gocke, Sylvia Sidney, Elizabeth Shelmway, Jamie Ballard. Directed by Paul Arnett. Thirteen year old Ben Wagner is caught between friends and family when his father, a contractor, wants to develop the lakeside area where Ben’s new friend Regina and her grandmother live. When strange things start to happen at the lake, Ben has a hard time not believing the rumors that Regina and her grandmother are witches. The Wiz Kid. (1989) Martin Forbes, Gary Forbes, Ulrike Kriner, Heiner Lauterbach, Narcisa Kukavica, Jake Wood, Lloyd Powell, Alec Christie, Andreas Vitasek, Pierre Franckh, Richard Rogler. Directed by Gloria Behrens. Bodo is a kid with abnormally high intelligence, over absorbed parents, and robotic toy companions. Bullied at school, he can only long in his dreams for Nova, the rock singer girl friend of the school’s meanest bully, until he creates Bodo 2, a clone who turns out to be a much more hip and agressive version of himself. Categories: Comedy, Science Fiction/Fantasy, Coming of Age. Wolfen. (1981) Albert Finney, Daine Venora, Edward James Olmos, Gregory Hines. Directed by Michael Wadleigh. New York Detective Dewey Wilson is determined to find out why people are disappearing and their bodies are turning up at the morgue in pieces. Soon he goes underground into abandoned areas of the city to track down the mysterious predators responsible. Categories: Drama, Horror, Science Fiction/Fantasy. Wonderstruck. (2017) Oakes Fegley, Julianne Moore, Jaden Michael, Cory Michael Smith, Tom Noonan, Michelle Williams, Millicent Simmonds. Directed by Todd Haynes. The stories of two children suffering from deafness, a young boy from Minnesota in 1987 and a young girl from New Jersey in 1927, are told simultaneously as they both seek family connections at the Museum of Natural History in New York City. World Famous Kid Detective. (2014) Lillian Almohajer, Sid Almohajer, Matthew G. King, Nick King, Karalena Morehead, Langston Ramsey, Patricia Reynolds, Clorissa Hodge, Benjamin Vu. Directed by Tim Kelly. Stanley Kid, owner of the world famous Kid Detective Agency must stop a devastating crime wave that is spreading across his island home while keeping himself and his pesky little sister, Nina, from falling into the clutches of his arch nemesis, the evil social worker Clorissa Hodge. Worst Friends. (2014) Richard Tanne, Noah Barrow, Kristen Connolly, Cody Horn, Larry Fessenden. Written and directed by Ralph Arend. When obnoxious Jake is injured in a car accident, the only person willing to take care of him is his former childhood friend Sam. But soon old rivalries emerge. The Wrong Guys. (1988) Louis Anderson, Richard Lewis, Richard Belzer, Franklyn Ajaye, Tim Thomerson, Brion James, John Goodman, Ernie Hudson. Directed by Danny Bilson. Five grown men, who peaked at age ten, get together to relive their glory days at their 25th Cub Scout reunion. Wrong Turn. (2003) Desmond Harrington, Eliza Dushku, Emmanuelle Chriqui, Jeremy Sisto, Kevin Zegers, Lindy Booth, Julian Richings. Directed by Rob Schmidt. Six young friends find themselves trapped in the Appalachian hills of West Virginia, hunted down by cannibalistic mountain men grossly disfigured through generations of in-breeding.